In this series of articles, we spotlight vendors from the FRESHFARM Rosslyn Farmers Market, which takes place every Wednesday evening from 4-8 p.m. at Central Place Plaza in Downtown Rosslyn. It's a beautiful night at the FRESHFARM Rosslyn Farmers Market but Rabia Kamara is not in her usual spot selling ice cream. 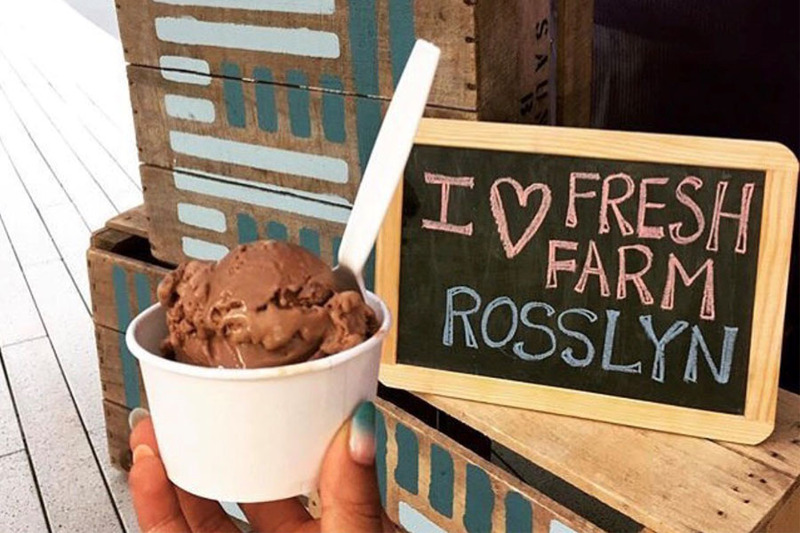 After partnering with the Rosslyn Business Improvement District earlier that day to give away free scoops to the first 150 customers, Kamara and her team sold out of her locally sourced, small-batch Ruby Scoops ice cream in 48 minutes. So, she hurried back to her kitchen in D.C. to get more. When she returns about an hour later, she is rushed, but still smiling and energetic. She hadn't expected so many people would show up. Since starting Ruby Scoops Ice Cream & Sweets at D.C.'s Union Kitchen in October 2014, Kamara's life has been marked by dozens of little surprises like this. It's been an exciting, productive time, but it's also been challenging. "Being a businesswoman, a boss and a leader is harder than I thought it would be," she says. "This entire entity is mine. I have to take care of Ruby Scoops, but I have to remember to take care of myself, too. Every time I think I've got it right, something happens and it's like, 'A-ha! Not so fast!' It's like preparing for the prettiest picnic and then getting rained out." A 2010 graduate of Virginia Commonwealth University with a bachelor's degree in Marketing, Kamara also attended the Culinary Arts Program at L'Academie de Cuisine in Gaithersburg, Md., where she graduated with distinction in 2012. For a while she worked in restaurants, preparing both desserts and savory dishes. At some point, she decided she wanted to try something else. Kamara produces premium small-batch ice creams, sorbets and sherbets from scratch. She uses dairy and produce sourced nearby in Virginia, Maryland and Pennsylvania and gets her vanilla from Madagascar via Mauritius Island, which part of her family calls home. She sells Ruby Scoops online and at eight farmers markets throughout the D.C. area. Ruby Scoops can also be found at some local grocery stores. Kamara works hard, and her days are long. She spends her mornings creating prep lists, answering emails and marketing Ruby Scoops. She's been trying to get her products into more retail outlets, which takes a lot of effort. She often relies on four team members to staff farmers markets throughout the week. She has three others working in the kitchen during the day. At night when it's quiet, she goes back to the kitchen to spin ice cream by herself. Her busiest months are July and August. Recently, Kamara obtained a $10,000 loan through Kiva.org, an international nonprofit that connects borrowers with lenders who crowdfund a loan in increments of $25 or more. She used the money to purchase a top-of-the-line, Italian-made Carpigiani ice cream machine. "It's 1,000 pounds and as tall as me!" she says. With her new machine, she has been able to increase production significantly, making three gallons of ice cream in six minutes and three gallons of sorbet in five minutes. Through it all, Kamara has had an enthusiastic crew at her side. All are minorities, although she says she didn't plan it that way. Some of her staff are participants in the Mayor Marion S. Barry Summer Youth Employment Program, which provides D.C. youth ages 14-24 with summer work experiences through subsidized placements in the government and private sector. "It’s a little like being an employer and a mentor as well," she says. "I want them to learn. No one likes a job where they're not learning." Kamara hopes to open a shop in the next year. She adores Richmond, where she attended college, and would love for it to be there. Currently, she's looking for investors. In the meantime, you can try her Ruby Scoops ice cream and sorbet at the FRESHFARM Rosslyn Farmers Market every Wednesday evening from 4-8 p.m. at Central Place Plaza. To learn more, visit rubyscoops.com and follow her on Instagram at rubyscoopsic and on Faceook at Ruby Scoops Ice Cream & Sweets. 1 This quote is from Kamara's bio on kiva.org.